The TGC is the Taken for Granted Challenge, a one day challenge between Jen from i used to hate birds and Nate from Texas blog, This Machine Watches Birds, the goal of which is to find and photograph birds specific to our respective home counties as selected by each other. The reasoning behind the TGC is that we have both become accustomed and nonchalant about certain birds that are specific to our home counties, birds which would make our counterpart drool, scream, and chase. We realize that we have taken some amazing birds for granted, and we have both decided that we need to remedy this. Ah, the rules. On the morning of the TGC, we will text each other a list of: 5 target birds, 3 provisional birds (in the event that some of our target birds are impossible), and 1 bonus bird that is possible, but would be a new county bird. We have one day to find and photograph the selected birds in our home county, and we will have no prior knowledge of what birds we will be looking for. Besides the glory of victory? The loser will send the winner a six pack of a regional microbrew. Weather permitting, Saturday, December 21. So, stay tuned folks, and enjoy the opportunity to witness the animosity brought about by mutual jealousy and rage at the respective winter birds of the Pacific northwest and central Texas. Your party will stop, Jen. Like Johnny Lawrence from the Cobra Kai Dojo, your party will stop. Hee. I LIKE it! I was just relating yesterday that I didn't know how great birding in San Diego is in winter until I spent some time at Grand Canyon in Jan/Feb & walked around (in the snow…) thinking, "Where the hell are all the birds?!?" Ah… they're at the beach, warming their toes in the San Diego sand. Go Jen, Go! Those Texans...who do they think they are?! 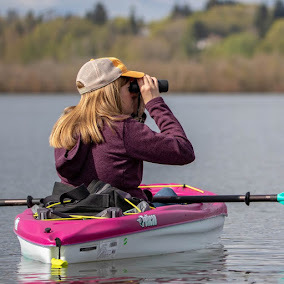 We are better birders in Oregon!! ;) Can't wait to see the recap. Cool! Can he get you a Common Grackle? Good luck, Jen! I think you will do well for your home state! Happy Birding! Yahoo!! Love a good knock down...course I will enjoy the spoils of both of ya!! This is great. Good hunting to you Big Bins Jen. I love the creativity. I'm always looking for ways to add a little spice to birding.I like the prize you picked too-have fun!